Perfect summer soap for a hot summer day. You Save $19.05 by purchasing this kit rather than buying the items separately. Sorbitol, Propylene Glycol, Water, Sodium Stearate, Sodium Laureth Sulfate, Sodium Myristate, Sodium Cocoyl Isethionate, Glycerin, Triethanolamine, Fragrance, Titanium Dioxide, Iron Oxides, Yellow 10. COMMENTS: I made the soap, I even posted a photo on your FB page, it's so beautiful, very simple and easy to understand directions. Everyone LOVES the Iced Tea scent. You can't go wrong, it works wonderful, plenty of bubbles and squeaky clean. 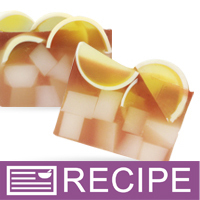 "Iced Tea Soap Loaf Kit"
COMMENTS: What can I say! This took a little more time to make, but was well worth the extra time. The soap turned out just like the photo pictured. It's definitely a real eye catcher and the fragrance is fresh and clean. It smells just like real "Iced Tea with Lemon"!! My customers are really impressed with this work of art in a soap product. COMMENTS: This was so much fun. I can't wait to try it. It smells great. "Why does WSP suggest pricing this product at a money-losing price point? (8 x $6.95 = $55.60; $55.60 < $77)"
Staff Answer The suggested pricing is just a suggestion. You should price your product according to what you think people would pay in the area you live in. The kit also contains such items as 2 silicone molds and a mini-mixer which is not included in the cost of the soap. These products can be used again so would not be figured in the price of the soap.